Flexicose Review – Is This Product Safe To Use? 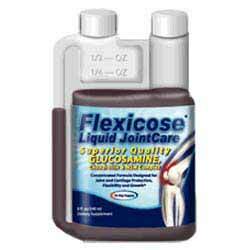 Flexicose is a liquid joint health treatment that can be used by humans and animals alike. Manufactured by DTC Health, the information for Flexicose is presented on the official website in a detailed but very confusing way. There are numerous sections and links, many containing repetitive information that make it very hard for the consumer to navigate. Some of the better parts of the website include a lengthy and informative FAQ section, several customer testimonials and links to auto-immune disease resources and organizations, such as the Arthritis Association. All Flexicose products have a 90-day money back guarantee and free bottles of the product are available for customers who refer friends to the website, submit a testimonial or order more than three bottles. Customers can either purchase Flexicose directly from the website or at independent retail stores. Because it is delivered in liquid form, Flexicose is quickly and easily absorbed by the body. Although there are three types of Flexicose (for humans, athletes, and animals) all formulas are identical, and they are labeled differently for marketing purposes. Joint Health substances Glucosamine, Chondroitin and MSM. All three ingredients work together to help repair existing cartilage and connective tissue damage, plus supply the means to build stronger and more durable joint components. Added to these three are a number of anti-inflammatory ingredients, such as Aloe Vera, Boswellia and the lubricating Omega-3 fatty acids. Anti-oxidant vitamins A, C and E are also in Flexicose as is Manganese, Yucca and Bromelain, a pain reliever that acts in the same way as an NSAID, which although effective sometimes cause gastrointestinal upset. Flexicose is designed for long-term maintenance of joint health and the dose can be decreased over time. Most people find that Flexicose takes about a month to have an effect in the body and they can ‘jump start’ the treatment by doubling the initial dosage. While all the ingredients are listed only the amounts of the Glucosamine and Chondroitin are provided. What are the Pros of Flexicose? What are the Cons of Flexicose? Even though the amounts of all the ingredients are not known, the fact that Flexicose contains the full recommended amounts of Glucosamine and Chondroitin certainly means that those with damaged joints would benefit over a period of time. Because it is in liquid form, it is suitable for those unable to swallow capsules and would be easy to give to animals if added to their food or drink. While the Flexicose website can be confusing, it does contain a great deal of useful information and advice regarding degenerative conditions such as arthritis, rheumatism, and osteoarthritis, making it worth reading for anyone suffering from these painful diseases.